Our 250US gauge is often referred to as the “windmill” pattern. Designed for a one-step installation on large shafts or where access is restricted, it can be installed in minutes, requires only 5 solder connections, and is rugged and easy to handle without damage. 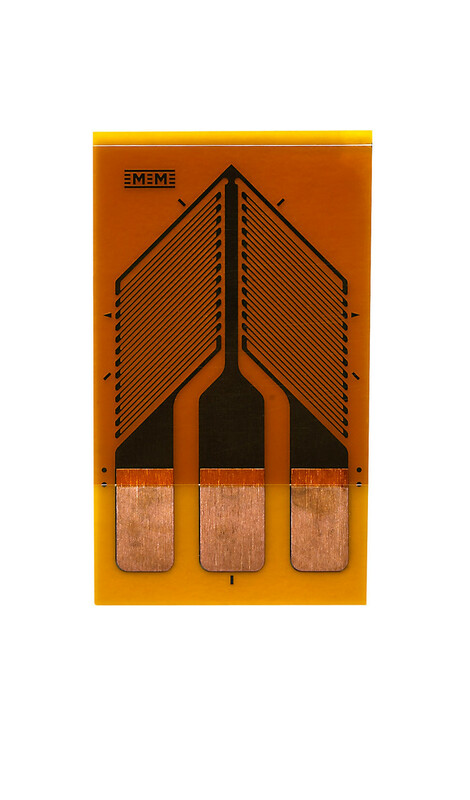 This is a dual-grid, common-tab pattern, with 3 solder connections at one end of the gauge. Two of these are mounted diametrically opposite on a shaft and wired as a single full bridge. Somewhat more complicated to install, it will provide more accurate data in some situations. It’s important to know that the central common tab is for the signal output. We have a wide variety of full, half and quarter bridge gauges designed for torsion measurement, including high-resistance miniature full bridges and electrically independent (4-tab) dual element gauges. This allows anything from single-backing installations on very small shafts, to multi-element high accuracy measurements. 8-gauge bridges are quite common, with dual-element gauges at each 90° location around the circumference. Precision alignment of the gauges is critical for accurate torsion measurement. If you cannot get the shaft to a marking table or dividing head then placing a “V” block will automatically enable a perfect axial alignment mark to be made. To get diametrically-opposite locations use a strip of paper, wrap it tightly around the shaft and mark off the overlap. Now remove it, fold it exactly in half to produce a clear crease, and rewrap it onto the shaft. For the 90° positions, fold it in half twice! Adhesive choice can be a function of the installation environment and desired accuracy and longevity. M-Bond-200 is great for short-term, M-Bond-AE10 for a room-temperature long term installation, or M-Bond-610 for ultimate performance and long life (but must be heat-cured). An appropriate coating will protect the installation from all manner of environmental attack, with M-Coat-A suitable for laboratories, M-Coat-3145 for moderate protection, or M-Coat-JA for long-term, water and oil-resistant protection. Extreme environments could require additional protection built up in several layers. For large driveshafts this is generally performed by calculation with reference to the shaft diameter, modulus of the material, and gauge factor of the gauges used from the engineering datasheet. Reference to a calibrated torsion transducer can offer an easy-to-apply torsion but will be limited by the accuracy of the transducer. Direct calibration using dead weights on a lever arm can give more accurate results but it’s important to load the item and support it correctly. Just bolting a lever to the end of a shaft or transducer will also apply bending forces which can affect the results. For fully-rotating applications the strain gauge bridge will be directly connected to a wireless transmission system such as WISER from TECAT Performance Systems, Mantracourt T24 or similar. 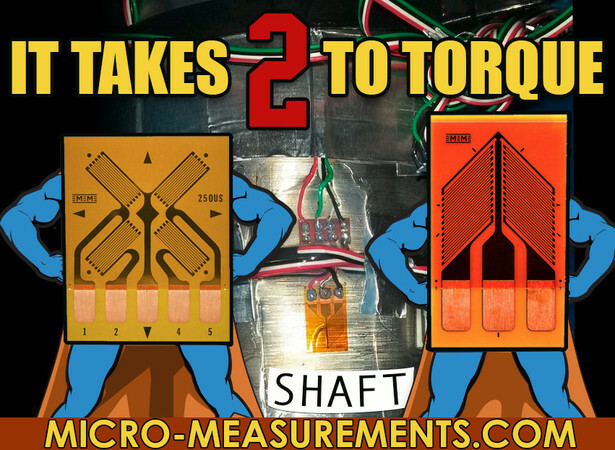 How to install a strain gage sensor on a shaft? Remember that now, with a strain gage sensor bonded to the shaft, our shaft becomes the transducer. Dry abrade with 220 for steel 320 grit for aluminum, silicon-carbide abrasive paper. Wet abrade with 320 for steel or 400 grit silicon-carbide abrasive paper and M-Prep Conditioner. Scrub with a cotton tipped applicator (CSP-1) and M-Prep Conditioner A. Using a clean dry gauze sponge (GSP-1), dry the surface with a single wiping motion. Using a clean dry gauze sponge, dry the surface with a single wiping motion. Step 2 - Mark shaft surface for strain gage orientation and alignment. The strain gage should be installed inline or 90° to the long axis of the shaft. For a straight reference line square to the long axis, wrap a piece of paper around the shaft, align the edges and then mark or etch the straight reference line onto the shaft. For a line along the long axis clamp the shaft to a flat surface then slid a square down the length of the shaft. If a pair of shear gages are to be installed do this to both sides making two lines 180° apart from one another. Step 3 - Prepare strain gage for mounting. Chemically clean a glass plate or similar smooth surface. 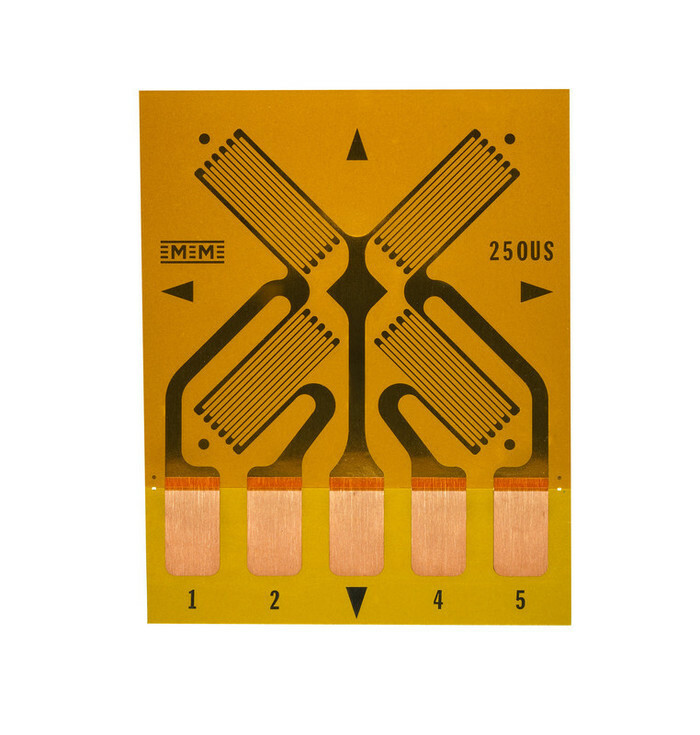 Remove strain gage from package. Lay it out on the clean glass plate shiny side up. Apply PCT-3M gage handling tape to top side of gage. For the 250US two pieces of tape will be required to overlap as it is wider than a single width of the PCT-3M tape. Tape gage in place on the shaft using the previously made alignment marks on shaft and the alignment marks on gage properly place the gage. Lift one end of tape at a shallow angle until the gage is free from the but the tape still holds the gage alignment, then “hinge” back the tape to expose bonding surface of the gage. Hit the brush on the inside of the Catalyst C bottle 8 to 10 times to minimize the amount left in the brush. Then using the side of the brush as a squeegee put a thin layer of the Catalyst C and allow to air dry for 1 minute. Using a dry gauze sponge folded into quarters and a single wiping motion push the gage back into its aligned position. Apply thumb (or heel of hand if gage is large like the 250US) pressure for one minute, followed by a minimum two-minute wait before removing the PCT-3M tape. Bond strength increases rapidly during first five minutes. Carefully peel back PCT-3M tape 180° back on itself remove it from the strain gage. For environmental protection under laboratory conditions – Apply M-Coat A polyurethane coating over the strain gage and solder joints. If the part is to exposed to an outdoor environment our M-Coat JA. The M-Coat JA is two-part polysulfide polymer compound which when fully cured, forms a hard rubber-like covering that provides an effective barrier against water and many other fluids. This tough coating also protects installations from mechanical damage.